Up until recently the diamond industry had a structural flaw — just one player controlled it. De Beers was the diamond industry, and diamonds were synonymous with De Beers. However, over the last 25 years, a series of events led to the dismantling of the De Beers monopoly. Today, De Beers no longer has complete control of the diamond industry, and for the first time in a century, market forces, not the De Beers monopoly, drive the diamond market. In the late 1800s after a massive diamond discovery in South Africa, a diamond rush was born, and businessman Cecil Rhodes bought as many diamond mining claims as he could, including farmland owned by the De Beer family. By the turn of the century, Rhodes had accumulated enough properties that his company accounted for the majority of the world’s supply of rough diamonds. He called his company De Beers Consolidated Mines Limited. As De Beers maintained a hold on the worlds rough diamond supply through the first quarter of the 20th century, financer Ernest Oppenheimer began accumulating shares of De Beers whenever available, and reached a controlling stake of the company by the mid-1920s. Under Oppenheimer’s control, De Beers further expanded into every facet of the diamond industry, intent on monopolizing distribution. De Beers successfully influenced just about all of the world’s rough suppliers to sell production through the De Beers channel, gaining control of the global supply not produced by De Beers mines. The cartel was born, giving Oppenheimer the power to influence diamond supply and thus diamond prices. The De Beers distribution channel, named the Central Selling Organization or CSO, (later changed to Diamond Trading Co. or DTC), had the power to sell what, when, and where they wanted to. In order to buy from CSO, membership as a “Sightholder” was required, which was completely the discretion of De Beers, as was the quality and price of the product being sold. No negotiation between the CSO and Sightholder occurred, all transactions were take-it-or-leave-it. In order to maintain a stable but rising diamond price, De Beers had the power to stockpile inventory in a weak market or raise the prices charged to Sightholders, and then in an excessively strong price environment (with the potential to damage demand), De Beers had the excess supply on hand to release to the market when needed, repressing disorderly price increases. To keep the system intact, it was necessary for De Beers to maintain control of the world’s rough diamond supply via purchases through CSO. In the second half of the 20th century, as new world class mines were discovered in Russia, Australia and Canada, it became more and more difficult for De Beers to purchase all global production. The biggest risk to the survival of the cartel was for mines to begin selling directly to the market, thus bypassing De Beers. Source: WWW International Diamond Consultants Ltd, Economic Times of India, and Authors analysis. Russia (present day the world’s largest diamond producer by value) began producing diamonds in the mid-twentieth century. 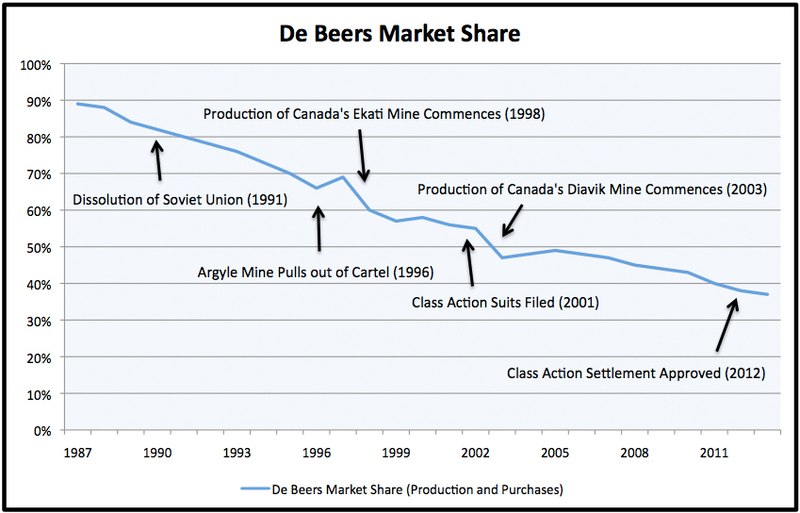 At first, the Russians agreed to sell production to De Beers keeping the cartel intact. However, this quickly became extremely costly to De Beers as the Russian mines produced greater quantity and lower quality stones than anticipated. This prompted De Beers to commence the ”Diamond is forever” marketing campaign, transforming the image of diamonds to a proxy for love, expanding demand of lower quality stones to a new middle class American market, in an effort to absorb the new supply. Another challenge emerged in 1963 when Anti-Apartheid legislation restrained the Soviet Union from dealing with a South African company. But the final blow to the arrangement came during the Soviet Union collapse in the 1990s, when political chaos and a weak ruble further separated Russia’s production from De Beers.